I want to share a story with you. But only read it if you know what it’s like to feel a failure. If you know that feeling, then you’ll understand where I’m coming from. Back in 2007, my world collapsed. My 25-year marriage had come to a devastating end. Suddenly, I was alone. My wife was gone; my kids; my in-laws; and many of our friends. I had to move away from the community I had come to love and call home. Don’t feel sorry for me. It was my call. I was desperate and I made what I thought was the right decision and I didn’t make it lightly. I moved into an empty flat, which a friend had recently sold. I had a month to get my life together before the new tenants moved in. To make matters worse, I had given up my full-time teaching job two years earlier to develop my dream of being a storyteller and coach. In addition to no longer having a family, I had no clients and few prospects. My confidence, my self-esteem, and my bank account were at an all-time low. 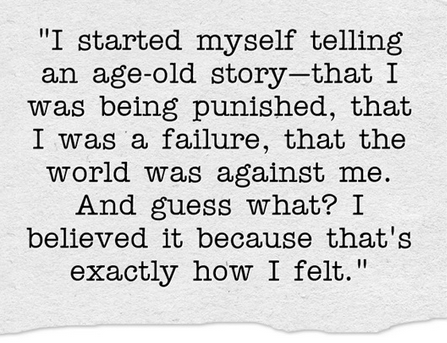 I started myself telling an age-old story—that I was being punished, that I was a failure, that the world was against me. And guess what? I believed it because that's exactly how I felt. My choice of story was disempowering me, making me feel sick and depressed. I made myself the "hero" of my tragic tale. I sealed myself up in a fortress of failure of my own making. Then, in November 2008, I received a call to adventure—an invitation to join a small band of international storytellers who’d been invited to the Middle East to work with groups of Arabs and Jews and perform at a storytelling festival in Galilee. But there was a catch—it would cost me all the money I had left. I applied only to learn that the deadline had passed weeks earlier. But several days later, I received a call from the organisers informing me that someone had dropped out and would I still like to come. I said YES! That experience was to become transformative. It was the beginning of my "new story". Working with Israelis and Palestinians and listening to their stories was a humbling experience. Experiencing the power of story to bring people together, to listen to one another, to try and understand one another, was so moving. When I returned to Scotland from the Holy Land, I was living my passion for storytelling and eager to help others share their stories too. I set up my StoryCoaching business and started advertising. I travelled to Canada and gave talks on my Middle East experiences. I wrote about them, published them on my blog and in a few magazines, and gave radio interviews. I also started giving storytelling workshops and talks about my passion for story. Soon, people started coming to me interested in learning more about storytelling and wanting to share their stories. They came from different walks of life—business, education, health, government, religion & spirituality, art and culture—but all had one thing in common: the willingness to venture into the world of story and discover their voice. And as my story changed, so did my fortune. I received generous support from Creative Scotland which enabled me to travel back to Canada to coach young people in storytelling skills, then to go to Denmark to work with the renowned psychiatrist and storyteller Lewis Mehl-Madrona. I sought out coaching, undertaking a three-year online training with American storytelling coach Doug Lipman. I was given support and practical advice from motivational coaches and storytellers like Brendon Burchard, Michael Margolis, Laura Simms, Shawn Callahan, and Lisa Bloom. And importantly, I received support to begin a year-long mentorship with David Campbell, one of Scotland’s premier storytellers. I learned a great deal from David during our afternoon talks over lunch, and in our sharing of stories with one another. He watched and listened to me carefully and gave constructive feedback. I reciprocated with his tellings. Together we delved deeper into the nature of storytelling, revealing our inner landscapes from which our stories were born. He shared a wealth of experience gained during the years of his friendship with Traveller storyteller Duncan Williamson and he listened intently as I shared my life experiences. During those conversations, I began to see my failure as a marriage partner and father in a different light. I was not casting my responsibility into the shadows, but rather finding new meaning in my emerging story. It served no one for me to live an old story of failure and self-loathing. It had only taken me down a long, dark tunnel of despair. But by deepening my understanding of and commitment to my inner storyteller, I was beginning to see my failure as an important catalyst to change. Out of the crucible of my mistakes, misjudgements, and melancholy a new story was taking form and I was being transformed by it. And in his way, David was an important witness to that transformation. 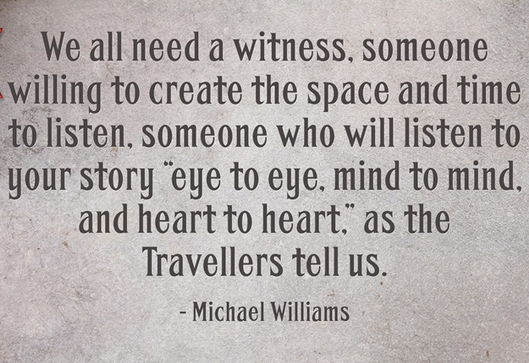 We all need a witness, someone willing to create the space and time to listen, someone who will listen to your story “eye to eye, mind to mind, and heart to heart,” as the Travellers tell us. A StoryCoach provides that time and space to his clients. I listen to your stories, I ask you questions, I reflect back what I hear and experience, and I open a window into the world of story. When you work with me, I help you hone your natural talents like voice, gestures, and body movement to tell a story with confidence and deep understanding. I give you time to find the meaning in your story. Together, we turn your passion and life experiences into engaging, inspiring, and transformative stories that you can use in your life and work. You become a more communicative and effective leader, artist, teacher, coach, parent, or whatever role you take on in the world. In 2012, an Aberdeen-based leadership consultancy invited me to co-facilitate the Aberdeen Leadership Forum, a group of oil and gas executive leaders interested in exploring the transformative power of business narrative. Over a year, we set out on a heroic journey, sharing our experiences and crafting stories out of them. We gained a deeper understanding of the mythical and narrative patterns in our lives, of archetypes, and how these applied to our leadership roles. Each member created a powerful public narrative embedded with values, with character, and with purpose, presence, and passion. With coaching, each member learned to tell those stories with an authentic voice, confident and true. I’m a successful StoryCoach today not because I failed my marriage and my family, but because of what I did with that failure. When an old story stopped working and threatened my well being, I was forced to create a new one. It required taking risks—like spending money, embracing conflict, seeking the help of mentors and coaches—and stepping across the threshold into the unknown. If this story resonates with you, then I suspect that you too are standing at the threshold, ready to make a change, ready to discover your voice, your story. The fact that you’ve read this far tells me you hear your call to adventure. I look forward to hearing from you. Thanks!